Corals of the genus Tubastraea (Scleractinia: Dendrophylliidae) invaded the Southwest Atlantic in the 1980s, but remained restricted in distribution to Ilha Grande and Arraial do Cabo, two regions within the state of Rio de Janeiro, Brazil (Ferreira 2003; De Paula and Creed 2004). Here, we report a 130-km southwestward range expansion of Tubastraea coccinea and T. tagusensis to Búzios (23°47.437′S; 45°08.653′W) and Vitória Islands (23°44.879′S; 45°00.918′W), state of São Paulo, Brazil (Fig. 1). The Búzios Island sites were first discovered in July 2008, where the colonies were observed in high abundances at 0.5–15 m depth. 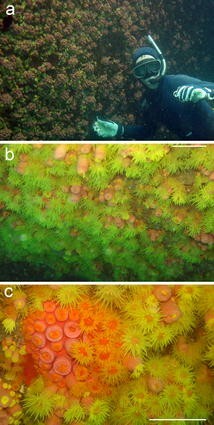 Subsequently, dives in 2009 and 2010 revealed additional sites at the same Island, as well as Vitória Island, representing the southernmost records and the first known range expansion of both Tubastraea species in the southwest Atlantic Ocean. The rocky shore communities at the newly reported sites are dominated by the zoanthid Palythoa caribaeorum, algal turfs and sponges, as well as by the scleractinians Madracis decactis and Mussismilia hispida, the latter being endemic to the SW Atlantic. Since the invasive Tubastraea spp. cover nearly 100% of the benthos in some locations (Fig. 1), they have likely displaced native benthic species (Creed 2006). 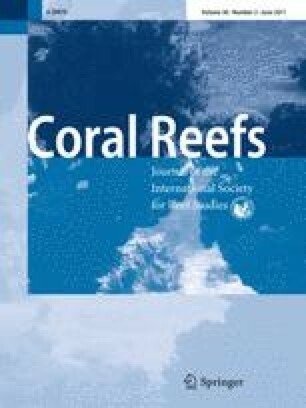 Given predictions of temperature increase for this century, these invasive corals may expand their ranges further southward in the SW Atlantic. 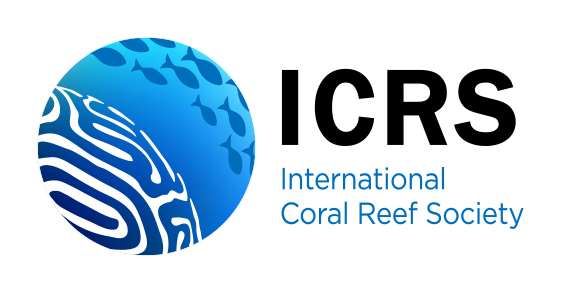 Long-term monitoring of marginal reef sites as reported herein are needed in order to investigate the development of opportunistic tropical corals.